Amish widow Emma Yoder’s three quilting classes bring the most unlikely of people together. Men and women of all walks of life find their way to Emma’s home, expecting a couple hours of sewing but leaving with new friendships and insights into life. Six unlikely folks join Emma for her first series of quilting classes, but their most important lesson has nothing to do with quilts. Can lost family connections be sewn back together, and will Emma let a friendship turn into romance? Now a newly-wed, Emma takes on a new class of hesitant students. 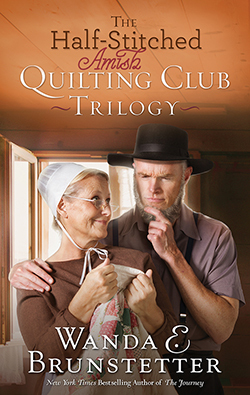 Once again a family finds restoration and forgiveness through quilt remnants, and romance blossoms despite a triangle of jealousy. Despite wintering in Florida, Emma offers a quilt class and finds students in need of more than sewing instructions. Class members searching for friendship, faith, healing, and perhaps a little romance find a safe circle in which to confess their needs.